DIY Doctor would like to welcome Gapseal to the website as they introduce a new project on how to seal and draughtproof the sash windows in your home. Gapseal is designed to seal gaps from 2mm to 9mm thick and is very easy to fit. Draughtproofing your windows is a great way to prevent heat loss in your home and therefore of course helps reduce your energy bills – so it’s win-win! 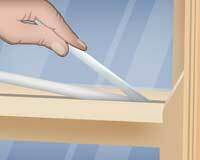 To find out more and to get step by step instruction on fitting Gapseal go to our project page.